Is your electrical contracting company drowning in the efficiencies of scheduling with paper and pencil? Smart Service makes it easier for you to schedule and manage your team of electricians. Our electrician scheduling software completely integrates with QuickBooks, making it so all your customer information exists in one place. Streamline your workflow and save on unnecessary headaches by adding electrician scheduling software to your business’ operations. When all your client data waits in one place, your team benefits! Avoid miscommunication and lost information when you switch to Smart Service electrician scheduling software. Smart Service helps by letting your office team set up your customer assignments within an easy-to-use interface. When your office team receives a new job, they can immediately see which electricians are available and assign the job with the click of a button. Your clients will enjoy the ease of the scheduling process. They’ll love how quickly they can get an appointment, making them a happy customer, one more willing to reuse your services! Electrician scheduling software makes it easier for your scheduling team to book appointments and dispatch your electricians more efficiently. With iFleet, our field service mobile app, you can complete the scheduling and dispatch circle for optimal productivity and communication among your team. iFleet allows for your field team to view their upcoming jobs, use GPS to navigate to job sites, review customer history and equipment information, update work orders, and complete paperwork, all from a mobile device. With Smart Service electrician scheduling software and the iFleet app, your in-house and field team will stay on the same page. Your team of electricians won’t have to worry about leaving necessary paperwork or invoices behind at the office. 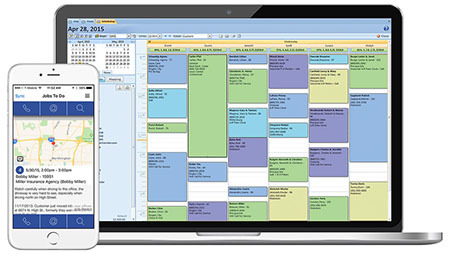 Keep your team on the same page when you use electrician scheduling software. Not only will your electricians enjoy access to necessary client information while they labor out on the job, they’ll also get updates on new jobs, route information, and gain the ability to communicate quickly with in-house employees. In fact, your team of electricians won’t even have to go into the office to get their routes for the day. All the necessary information about their assignments shows up immediately within the app on their mobile device. Meanwhile, your in-house team can view the locations of your team of electricians out on the field. This feature will help your in-house team accurately tell clients estimated arrival time for their jobs. Let your company make the most out of every day. See for yourself how electrician scheduling software can positively impact your business! Request a free demo of Smart Service today! Use these articles to crush the electrician industry competition!